Hockey Blog In Canada: Dateline's Keith Morrison: Hockey Fan? Occasionally, a hockey broadcast will go off its usual script and try to change things up with a unique twist on the show. While the broadcasting duo usually remains the same, it's often a new segment or an introduction that differs greatly from its normal start that is used to catch the attention of viewers. We saw the Calgary Flames have some fun with a video last year, and it appears that Rogers Sportsnet went ahead and brought a little Hollywood to their broadcast tonight... although it's far more grim than goofy when you bring NBC's Dateline and host Keith Morrison into the picture. 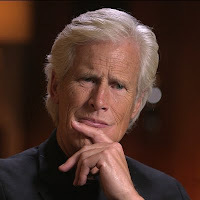 If you aren't familiar with NBC's Dateline, Keith Morrison usually sets the stage for the one-hour show by introducing a strange death or a disappearance or some other unnerving incident that usually involves a crime and requires deeper investigation. Here's an example of Keith Morrison's usual introduction to a story. That introduction obviously sets the stage for Dateline to investigate the details of the murder or disappearance, but Morrison has perfected the slow build of anticipation with his unique delivery. It might be one of the more iconic deliveries on TV at this point, so kudos for Keith Morrison for instilling his voice in our collective minds. So why is this relevant? Check out Sportsnet's introduction to their broadcast tonight. After a thorough voice comparison was done by the law enforcement agents, HBIC can positively conclude that Keith Morrison was involved in the creation of Sportsnet's introduction. Ok, it doesn't have the same cachet as Morrison's iconic delivery, but Sportsnet's desire to find a new player to take Matthews' place as the budding superstar on their broadcasts seems a little self-serving at best. Adding Morrison's distinctive voice is a cool detail, but it seems a little unnecessary given the circumstances. In any case, I want to know if Keith Morrison is a hockey fan. If so, it would be great to have him on The Hockey Show for a chat!